Honors Foundations are the underpinnings of the Honors College experience. Traditionally limited to 15 seats to maximize meaningful academic discourse, relationship building, and faculty-student interactions, these courses allow students to explore a diverse array of topics while often granting general education core credit. After the first 6 hours, Honors Foundations count as Honors Electives. Students may also pursue an Independent Study in a subject area chosen in consultation with a qualified faculty member who will supervise the project. Often, self-directed studies lead to conference presentations, publications, and other experiences unique to the student’s interests. Students can receive credit in a plethora of ways either in one single semester or over the course of many semesters. 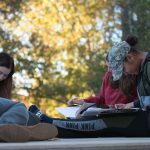 Departmental Honors courses are offered throughout colleges across the university and feature the most outstanding and committed faculty and are limited to only Honors College students. Departmental Honors courses are smaller than their non-honors counterparts and are traditionally offered as options to substitute for general education courses that fulfill core requirements. The Honors by Contract option provides up to 6 hours of Honors credit for Honors College students taking a departmental course at the 300 or 400 level. Honors by Contract courses satisfy Honors Elective requirements, but not Honors Foundation courses (UH-designated courses). In order to earn Honors credit, the student must collaborate with the course’s instructor (who must know of the student’s intention prior to the student completing the Honors by Contract application) to create an additional assignment or learning element to raise the course to Honors level work and make at least a B on the additional project. The additional work should not be just an extension of the class assignments. Rather, the extra project must be distinct from course syllabus and must broaden and enrich the scope of the course content. Once a student has an Honors by Contract project designed, in a course for which the student is already registered, and has the approval of the course instructor, the student should go to myBama (mybama.ua.edu), go to the Academics Tab, go to the Honors College box, and click on “Honors by Contract Application.” Students must complete and attach the Honors by Contract Project Proposal form to their application within myBama. The Honors by Contract application for summer 2019 and fall 2019 will open April 1, 2019. The deadline to submit an Honors by Contract application for summer 2019 is June 1, 2019. The deadline to submit an Honors by Contract application for fall 2019 is August 30, 2019. Absolutely not exceptions or extensions will be granted. Get approval from an instructor with whom the student will work. Then, design a project, e.g., research paper, dance choreography, short story, etc. For three hours of credit, students must do 135 hours of work during the semester, which is equivalent to the amount of work expected in any three hour course. 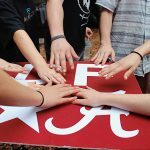 Once the project is designed and the faculty supervisor selected, the student should go to myBama (mybama.ua.edu), click the Academics Tab, scroll down to the Honors College box, and select the “Special Approval System Application” or see here for the Independent Study application. Students must complete and attach this Independent Study Project Proposal Form to their application. After submitting an application, an email will be sent to the faculty supervisor with a link to the online system. This is sent to an instructor’s UA email address, so that address must be included in the application. Go to the Student tab in myBama and click the “Add or drop classes” link. Be sure to jot down the CRN of the course. Enter the course’s CRN in one of the boxes at the very bottom of the page. The course credit defaults to 1 upon submission of changes. The number 1 is a link that the student can change and submit again. If this change is not made before leaving the “Add or drop classes” page the credit will remain at 1. If the student forgets to change the number of credits before leaving the page s/he can drop the course and register for it again. This will activate the numbered link once more. This will work only during the registration cycle. Credits cannot be changed by the student after close of registration. The Independent Study application for summer 2019 and fall 2019 will open April 1, 2019. The deadline to submit an Independent Study application for summer 2019 is June 1, 2019. The deadline to submit an Independent Study application for fall 2019 is August 28, 2019. Absolutely no exceptions or extensions will be granted. For any questions about the registration process, please email the Honors College at honors@ua.edu. All graduate level coursework (500 level +) counts towards the Honors College Elective requirements, and Honors College students are encouraged to explore graduate courses in their major field. Graduate level coursework does not count toward the Honors Foundation requirement. The Accelerated Master’s Program (AMP) is an option in some departments for talented and highly motivated students who want to earn a bachelor’s and Master’s degree in five years. Through AMP, students begin their graduate studies during their senior year. To learn more about AMP, read about it in the Graduate Catalog.